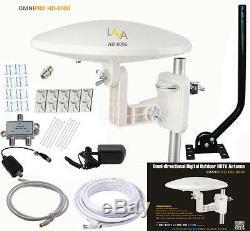 LAVA OmniPro HD-8000 Omni-Directional HDTV TV Antenna HD Cable Install Kit Jpole. 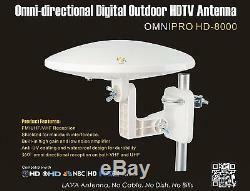 The new LAVA OmniPro HD-8000 outdoor omni directional TV antenna. The HD-8000 is a Great antenna for people that live within the city and suburbs. The Omni Pro HD-8000 is a multi directional indoor or outdoor TV antenna that receives signals from 360 degrees. The Omni Pro HD-8000 delivers an extremely stable signal. The advanced TV Antenna Circuitry built into the LAVA OmniPro HD-8000 includes a Low Noise/ High Gain Amplifier that provides strong reception for all the over the air TV broadcast signals and FM Radio. To make things even better we are including a installation kit with this antenna, which includes everything needed for a neat and trouble free installation. This kit includes LAVA's J-2012 universal J-Pole antenna mount, 50ft or 25ft of RG6 cable (for a second TV or a longer run) available in black or white, 6 more feet of RG6 cable also available in black or white, a 2 way splitter, 1 F-Type female splicer (to connect cables), 10 adhesive cable tie mounting pads, 10 cable ties and 20 hook cable clips. 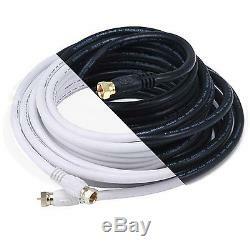 25ft or 50ft of coaxial cable available in black or white (please choose color and length above) 2 Way cable splitter 1 F-type female splicer (to connect cables) 10 Adhesive cable tie mounting pads 20 Hook cable clips 10 Cable ties. Hook Cable Clips with Steel Nail Hook cable clips allow you to secure runs of round cables like coax to walls and floorboards for a cleaner look and prevent tripping over loos cables. Less cable slip, easy installation. Just use a hammer to nail then to your mounting surface. Great for retrofitting cables to rooms where in-wall installations are no an option. DSU-2P, 2-Way Horizontal Power Passing Splitter. 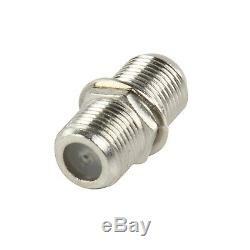 1GHz 80 dB EMI MATV power passing splitter with high retention seizing pins provides improved connectivity to connector center lead. High-performance printed board circuitry provides improved hum modulation and intermodulation parameters to ensure superior signal quality (DSU-P Series). Yellow-chromate plated zinc-alloy diecast housing ensures excellent ground bonding and long corrosion-free service life in indoor/outdoor applications. Epoxy-sealed back cover provides effective EMI-RFI shielding >-80dB, eliminating signal ingress to provide distortion-free pictures. Long precision machined F-connector threads ensure improved port-to-connector interface and accommodate external security devices. High retention seizing pins provide improved connectivity to connector center lead. 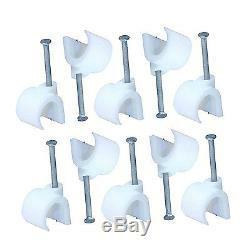 30x30mm Adhesive Cable Tie Mounts These high quality adhesive backed cable tie mounts are perfect for any application where a wire needs to be securely mounted without damaging the mounting surface. Just peel the covering off of the adhesive backing, stick the mount to the mounting surface, thread your cable tie through, zip it shut around the cable, and your cable is firmly mounted. Need to remove the mount? Gently peel the adhesive material from the mounting surface and it will break free without damaging the mounting surface. A great solution for securing cables to the back of televisions and home theater equipment, running cabling along the wall, running cabling along the roof (indoors) and under desks and tables. It can be stuck to any flat, hard mounting surface with ease and will hold your cables firmly and securely. 6 ft RG-6/U 30V 18AWG 75 OHM CL2 Coaxial Cable with F Type Connector Heavy Duty Quad Shielded RG-6/UL 18AWG Coaxial Cable 75 OHM 2200 MHz Coaxial Cables for Maximim Signal Transfer and Minimize Interference RG6 quad shield is great for hi-impact acoustics, antennas, cable television, and satellite installations, its durable 18 AWG copper clad steel center conductor is surrounded b foam polyethylene dielectric. Sweep testing ensures 3.0Hz performance at applicable frequencies. 40± Bare Copper-Clad Steel Conductor. CM (CL2) Rated PVC Jacket. Sweep Tested to 3.0GHz. Available in black or white. F-Type Female to F-Type Female Splice Adapters. Coax adapters are the perfect way to quickly change the gender or connector type on an already terminated cable. This adapter has an F female to an F female connector. 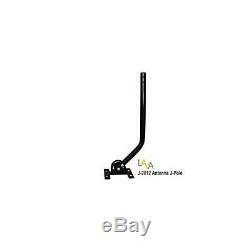 LAVA HD-8000 OMNI-DIRECTIONAL 360 DEGREE DIGITAL HDTV AMPLIFIED TV ANTENNA VHF UHF FM With the new concept Omni-Directional antenna for digital outdoor analog and terrestrial HDTV broadcasting reception. This model is uniquely suited for urban/metropolitan/suburban locations where multiple transmitters are circling you. Anti-UV coating and waterproof design. 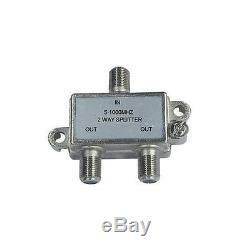 Lightweight, compact size and easy to install for both analog and digital TV signal reception. Built-in high gain and low noise pre-amplifier. You DO NOT have to adjust your antenna pointing to different directions. This Multi directional antenna provides excellent non-adjustments to receive TV channels more easily. With dipole inbuilt for the excellent UHF and VHF band signal reception. Specially Compatible with HDTV of various digital terrestrial signal (DVB-T;ISDB-T;DMB-T/H;ATSC). Ideal Distance 2060 miles (reach up to 130 miles). This antenna can be used both indoor and outdoor, with the included mounting accessories, it can be mounted on the wall or the pole. Antenna Main Unit Mounting Accessories Water-Proof Kit AC/DC Power Adapter Power Injector Manual. J-2012 Universal J-pole with Mounting Hardware. J-2012 Universal J-Pole with mounting hardware. This 20" mast with a 1" diameter is ideal for our LAVA Outdoor Antenna. The J-Pole has a pivoting foot, which allows installation on vertical or horizontal surfaces. Good for most of the the outdoor antennas on the market. Box size 19'x 5-1/2' x 2-3/4'. 25ft or 50ft RG6 (18AWG) 75OHM Quad Shield CL2 Coaxial with F Type Connector Heavy Duty Quad Shielded RG-6/UL 18AWG Coaxial Cable 75 OHM 2200 MHz Coaxial Cables for Maximim Signal Transfer and Minimize Interference RG6 quad shield is great for hi-impact acoustics, antennas, cable television, and satellite installations, its durable 18 AWG copper clad steel center conductor is surrounded b foam polyethylene dielectric. (please select color from above). 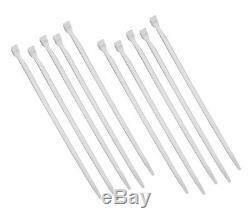 10 8 40LBS 3.6x200mm Nylon Cable Ties Organize that tangled mess of cables by securing them neatly with these 10 cable ties. Each cable can hold up to 40 lbs. Please include copy of the invoice with your return package. The item "LAVA OmniPro HD-8000 Omni-Directional HDTV TV Antenna HD Cable Install Kit Jpole" is in sale since Wednesday, April 8, 2015. This item is in the category "Consumer Electronics\TV, Video & Home Audio\Other TV, Video & Home Audio". The seller is "photogearetc" and is located in Lake Forest, California.